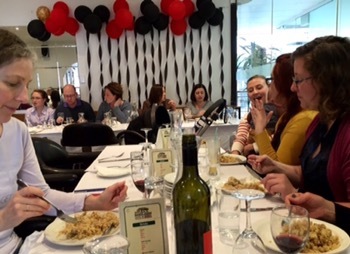 The $20 weekday lunch special at Bellucis in Manuka is as good as ever. 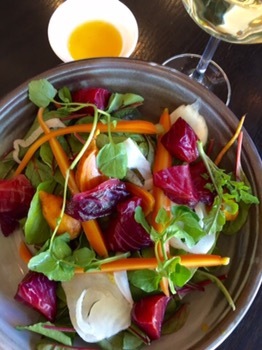 The two salads on offer as light and fresh, perfect with the glass of wine that’s included. 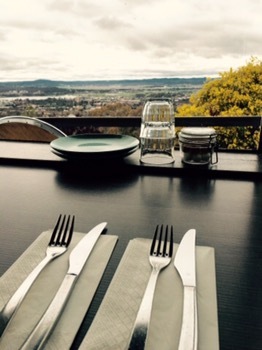 Little Brother Red Hill – back again already! 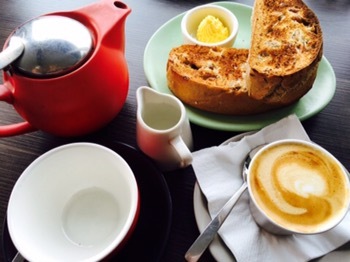 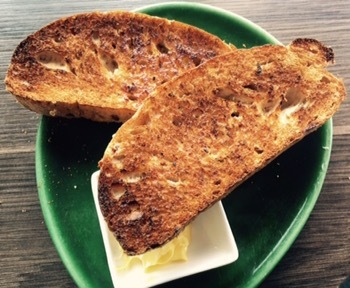 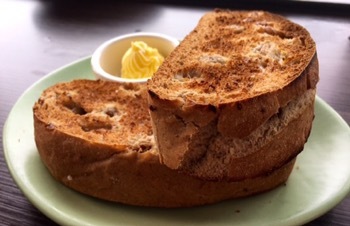 I’m not sure why, but I just love the raisin toast at Little Brother Red Hill. 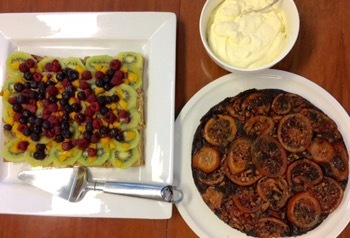 On another cold and rainy day, it was just perfect for my brunch. 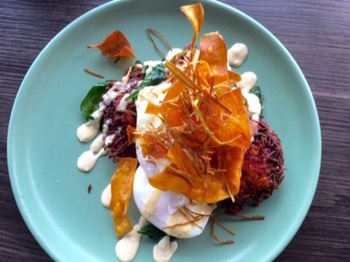 My fellow diners chose the Sweet potato and beetroot fritter with poached eggs, wilted spinach and horseradish cream $19 which was a lovely dish. 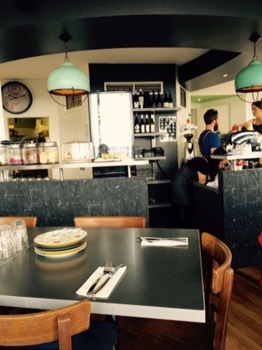 But a big part of why I enjoy heading to Little Brother (besides the great view) is the lovely, warm service! 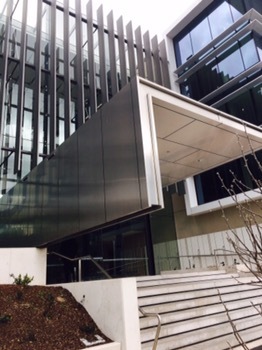 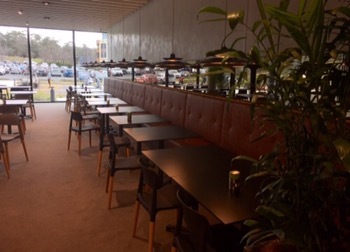 Highly approachable and accommodating, Little Brother also takes bookings and gives Canberra Entertainment Book holders a 25% discount. 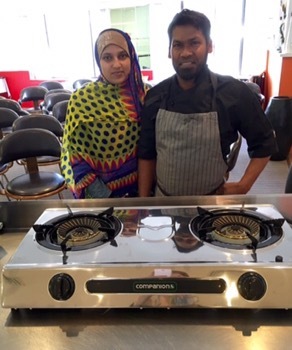 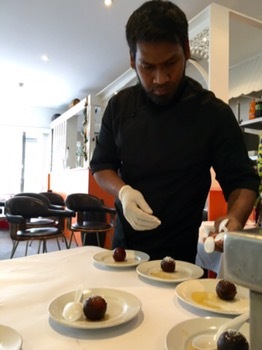 Last Saturday Shafique and Farhana hosted Cooking Circles Canberra to an amazing introduction to Bangladeshi cuisine at their Manuka restaurant, Taste of Bangladesh. 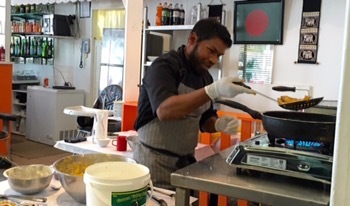 …along with ginger and garlic, ghee, fried onions. 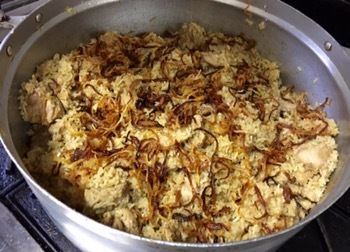 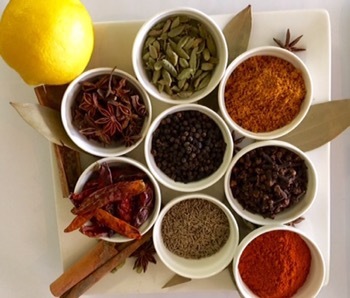 The spices were ground and mixed with yogurt to marinate the chicken which was then cooked..
…before being layed with the separately cooked rice for the final cooking, that allows the flavours to penetrate layers. 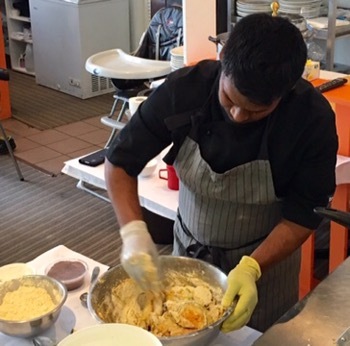 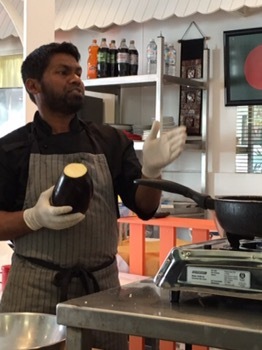 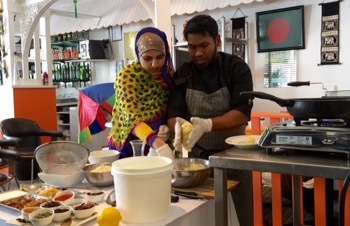 While the Dum Biriyani was cooking, Shafique showed us how to prepare the wonderfully delicious classic – Gulab Jaman. 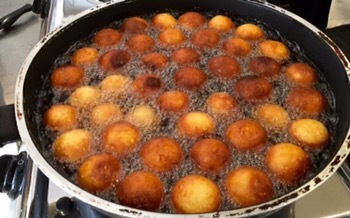 ….and cooked in oil before being added to a sugar (and cinnamon stick) syrup. 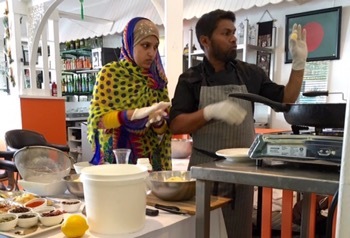 Farhana told us about the traditional (lengthy) method used in Bangladesh to prepare this dessert, using paneer. 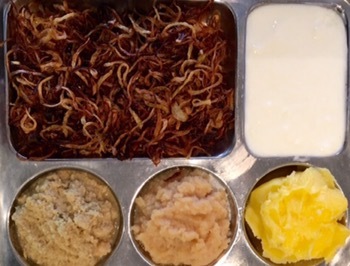 When a new baby is born into a family, the new parents send this special sweet to friends and neighbours. 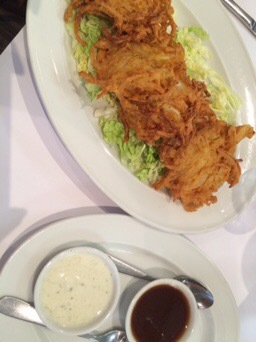 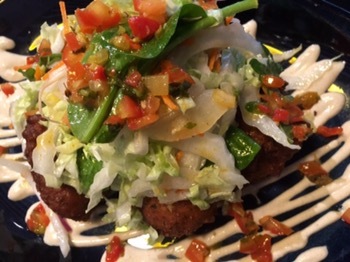 While we were waiting for the Dum Biriyani, Shafique also showed us an Eggplant Pakora (Beguni) entree. 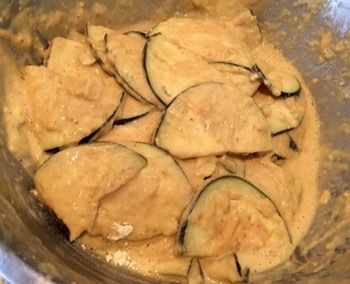 …and then chickpea flour and water to coat it in batter before frying it. 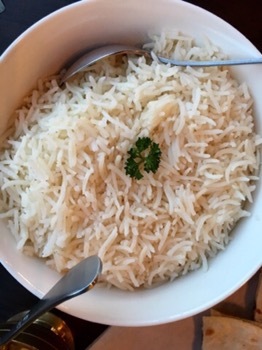 We were all so eager to enjoy this delicacy that no-one captured any photos whatsoever! 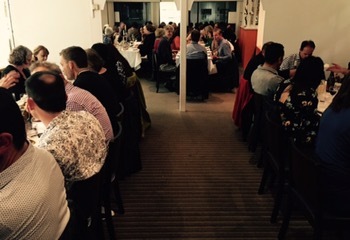 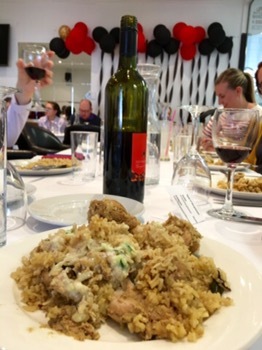 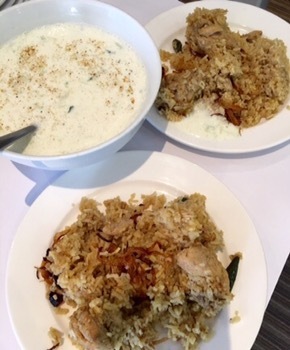 …but when the Dum Biriyani was served, perfectly matched with yogurt raita, the flavours were wonderful to savour! 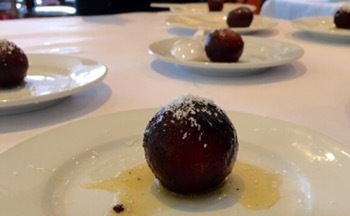 And the Gulab Jaman was a perfect end to a excellent meal, with fine company and much pleasure for all the senses, discovering another lesser known world cuisine! 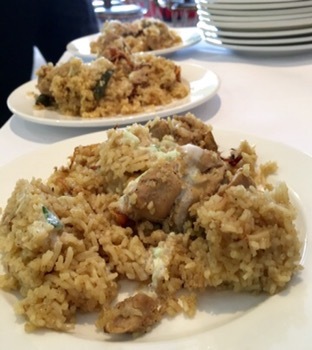 So pleased that Taste of Bangladesh are doing Thalis at lunch again!! 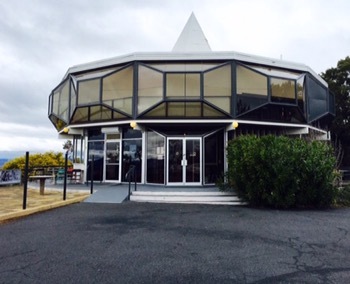 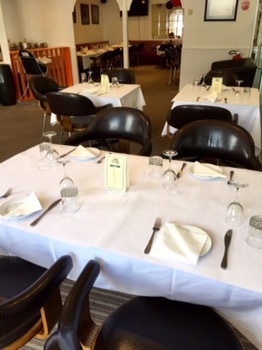 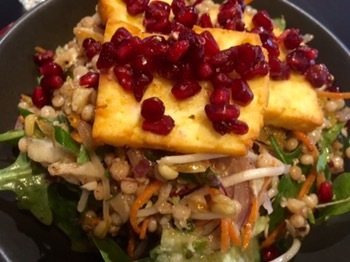 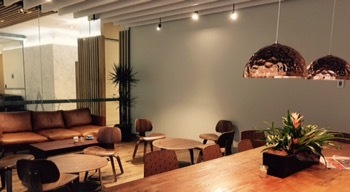 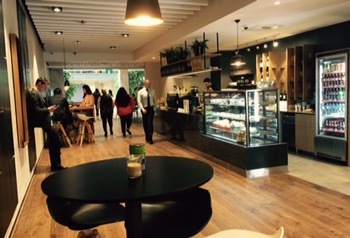 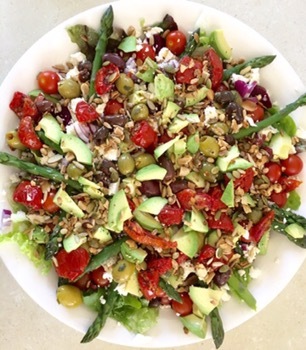 Monday to Friday 12-2pm, they are offering what must be the best value lunch in Manuka. 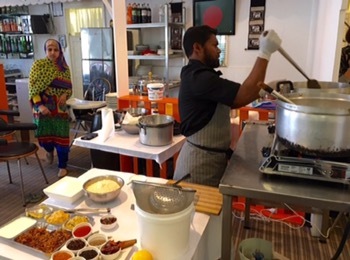 $13 buys a large serve of rice, large pillowy naan, poppadom and three curries – a vegetable kadhi and two others that change each week. 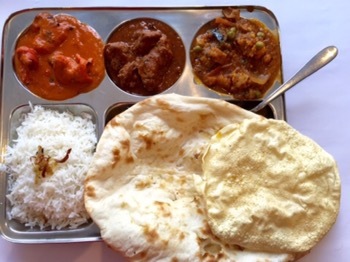 This week it was a delicous butter chiken and beef vindaloo…so good!! 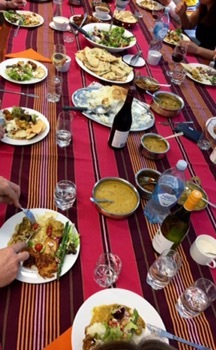 And if you fancy a glass of wine or best togo with yor Thali, just take it along, there’s no corkage charge!